Back at the beginning of March, one sunny Tuesday evening after work, Steve and I jumped in the car and headed on over to the brand new Mollie’s Motel & Diner in Buckland, Oxfordshire. Bearing in mind that we hit the after work traffic, had to fill up on petrol, took a wrong turn AND got stuck behind a tractor it took us around an hour to get there from central Reading. So not that bad really. That wasn’t an intentional negative start to this blog post, by the way. If anything we were both quite excited about our invite to stay over at Mollie’s and we were equally excited about eating at the Diner too. With a nod to 1950’s America, the roadside motel looked quirky when I had a quick nosy online and the Diner menu consisted of classic American food alongside cocktails and hand-made milkshakes. Plus, the idea of someone actually doing roadside services well, was very appealing. I’ve only ever been to Oxford once and it was with a friend who wanted to do completely different things to me so I’m really keen to go back another time. Somebody once told me it’s very similar to York too, but I’m not sure how true that is? Mollie’s is on the A420 between Oxford and Swindon and around a 25-minute drive from Oxford city centre and 35 minutes from Bicester shopping village making it the perfect place to stop off for food (there’s a drive-through too if you’re in a rush). I was mostly curious about the food. It’s always about the food! Would it be like McDonald’s, TGI’s or even (eek) Little Chef? I hoped not. Could it an amazing alternative to the UK’s usual motorway service stations (with a BP garage as its only neighbour), and would they be expanding across the UK? I’d barely done any research so was going in totally blind! I didn’t even really know much about the link to the famous Soho House until Googling afterwards. Mollie’s is, in fact, the latest venture by the team behind Soho House – which runs the famous Soho Farmhouse near Chipping Norton and a string of exclusive private members clubs around the world. Anyway, thankfully it turned out to be nothing like McDonald’s or TGI’s and its way nicer than the overpriced service stations offering greasy old questionable food. Parking up and heading straight to the check-in desk which is called the ‘General Store’ was all very straight-forward. One thing I hadn’t realised is that everything in the hotel runs through Mollie’s app. The TV, check-in, paying for things, booking a room…basically everything! It took us a good few minutes to figure this out, but eventually, we got there. The General Store looks like more than just a reception area mind. With lots of comfortable chairs and tables, soft cushions and free WiFi, tea and coffee it makes the perfect hang-out/work area. There are everyday essentials, such as charging cables and skincare products available to borrow, and bags of American style sweets to buy if you fancy a sweet treat. 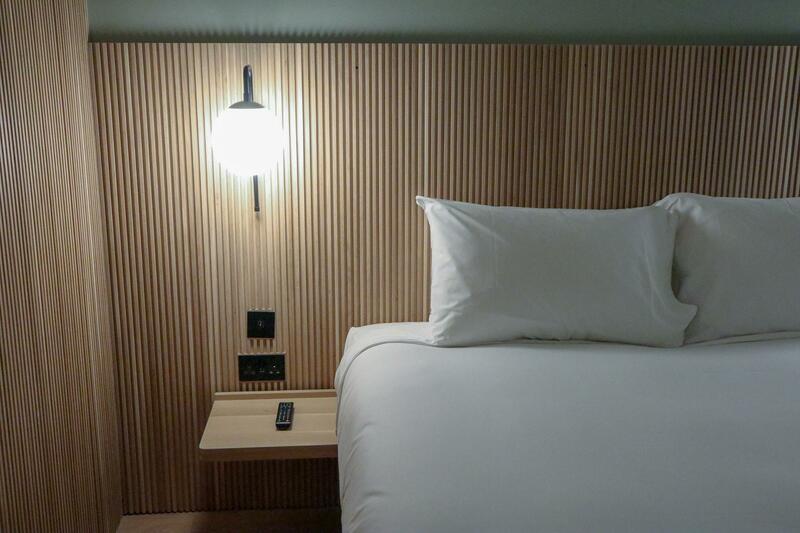 There’s a bit of a Scandinavian feel to the decor which I thought was a bit odd considering they’ve marketed it as a 1950’s American type place, but on the flip side it’s been done SO well and the smell of all that fresh wood as you walk to your room is lovely. With 79 rooms ranging in size, from cosy double rooms to interconnecting family rooms with modern bunk-beds, all have Egyptian cotton sheets, rainforest showers and Cowshed products in the bathrooms. Room prices start at £50 and we were staying in a standard ground floor room. For some reason, Steve really wanted to be on the ground floor as he thought it would feel more like a real ‘motel’ experience. The bathroom was quite small, but they are very smart and the shower is the perfect strength and size. I wasn’t keen on using a 2in1 shampoo and conditioner and was a bit surprised about that. Also, the hairdryer is kept in the General Store so when you jump out of the shower and go to find it…you won’t be able to! And you can’t call anyone either, because it’s all done through the app remember. But it was fine, I had Steve with me so sent him on the hairdryer hunt. At around 7.30pm we headed over to the diner and it was packed! As in totally heaving. You can’t book in advance so you just turn up and wait to be seated, so I was a bit worried as I was so hungry! Our lovely waitress found us a table quite quickly and we were having a little chat when we all of a sudden realised, at exactly the same time, that we both had the same Yorkshire accents, and in fact, were originally from pretty much the same place in North Yorkshire. Steve being Steve pretty much always makes references to his favourite films whenever he possibly can (even though he’ll deny he does this), spotted the milkshakes were £5 each and instantly started going all Travolta on me. Can you guess what film he was re-enacting? I absolutely did. Two in fact. Chocolate and salted caramel. We shared. They were both amazing and absolutely worth the £5. We both opted for the vegan burger, shared some nachos (with no guacamole!?) and both ordered a side of the Mac ‘n’ Cheese too. Steve loved the vegan burger and the beetroot bun made a refreshing change. I was in one of those strange situations where I just couldn’t decide if I liked it or not! It was quite a soft burger which meant it fell apart easily, but it was full of flavour and different from any other vegan burger I’ve tried. The garlic aioli and the crispy onions were a nice addition but the best thing about it is that you can tell it’s a healthy vegan burger and not a fake Quorn type concoction. The problem is, I compare all the burgers to my favourite Honest Burger one. And that’s going to take some beating! The Mac ‘n’ Cheese was nice, but maybe a tad dry. There just wasn’t enough cheese sauce and if anything it was just like pasta with cheese on top! Definitely not like the Mac n Cheese I’ve tried in real American Diners. We headed back over to our room and planned to binge on some NetFlix and have some chill out time. Turns out I was more tired than I’d realised as I can’t even remember what we put on as I fell asleep within minutes and didn’t wake up until my alarm went off at 7am! I didn’t even stir through the night. Then it dawned on me that our room was totally dark and totally silent! I’d had the best nights sleep I’d had in forever and it felt so good. I’d go back if not just to sleep like I did that night. Is Mollie’s worth the visit? Absolutely! Mollie’s is a Motel like no other. As much as I preferred the Motel to the Diner part, it’s still a far better affordable alternative to most roadside options. Would we go again? 100% if I’m over that way we’ll definitely go again. Do I hope they open more? I’d love that! If it could happen along my driving route to York when I go home, that would be just perfect. *My stay at Mollie’s was gifted in return for a review post but as usual, all words and opinions are my own. "(AD) The New Menu at Revolución de Cuba Reading"